ined enough purine to lead to gout. Foods containing purine are now affordable, which has led to its rise in the general population. Why am I, an osteopath, writing about gout? Because it occasionally slips through the net; I have diagnosed gout clinically and given advice for self-management of this painful condition. 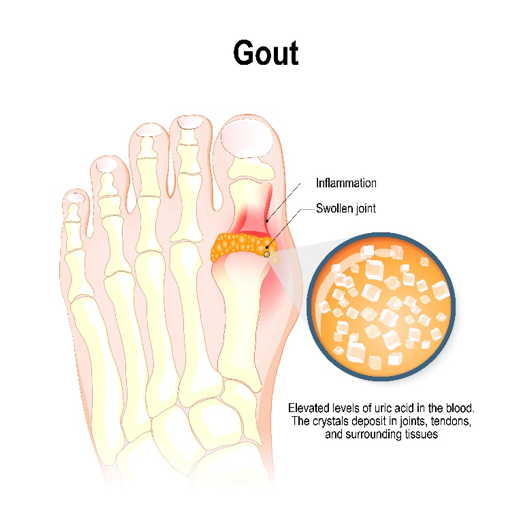 Gout is a type of arthritis, similar to rheumatoid arthritis. It is heavily associated with other metabolic disorders, such as obesity, diabetes and hypertonia. It can also be hereditary, but it is a common result of eating purine-rich food. Purine is a substance that is found in alcohol, shellfish, red meat and organ-based meats, among other things. It isn’t just a poor diet and lack of exercise that results in gout, certain medications (including aspirin & diuretics), psoriasis, ketosis, hypothyroidism and hypertension can all lead to increased urate production. In addition to this, 40% of patients with gout have kidney disease. There is also a recent study that links sleep aponia with an increased risk of getting gout. Gout is 4x more likely to occur in men and has a prevalence of around 2.5% (which increases with age) today. Serum uric acid in post-menopausal women reaches similar levels to men, putting them at risk. There seems to be a genetic predisposition for gout, as some people are less efficient at reabsorbing uric acid, meaning it ‘spills over’ into the joints. Gout is seen clinically in overweight patients that have had excessive food and/or drinking binges. It typically presents clinically with middle-aged, overweight males who have extreme pain in the big toe. Why it occurs there first is unknown. Unfortunately, almost 90% of people diagnosed with gout go on to suffer repeat episodes over the next 5 years. Very typically, the pain starts during the evening in the joint of the big toe. It is extremely painful and is famous for not allowing the patient to tolerate any pressure. After the first episode, it can last up to a week. In the long term, gout is an independent risk factor for all-cause mortality, due to the unhealthy condition a person has to be in to develop non-genetic gout. There are strong links with cardiovascular and kidney disease, however, a change in lifestyle can reduce the risk of these conditions and mortality. As you’d probably have guessed, gout isn’t something osteopathy can cure, however, your osteopath can help diagnose gout. Initially, medication to reduce inflammation and pain are used, common prescriptions include non-steroidal anti-inflammatories. Long-term strategies are heavily based on lifestyle management, your osteopath will have good knowledge of what food and drink should be avoided. The foods and drink with the highest risk include meat, seafood and alcohol; beer and spirits provide the biggest risk, with wine providing the lowest risk. I get a lot of patients that are opposed to long-term medication use, and this can actually be a potent motivator. The feeling of having to chemically alter your physiology due to lifestyle habits provokes a big realisation.